Throughout most of all the preceding parts of this examination of the Constitution, we have focused on the top-down manner in which powers are delegated. But according to the global covenant, social compacts (governments) operate lawfully only by consent. Consent can only be given by individuals. If groups of individuals operate as lawful groups, then they operate based on the consent or acquiescence of each individual within the group. So there is an inherent emphasis on a bottom-up approach to compact formation if the social compact is lawful from the perspective of the global covenant. The elemental component in this bottom-up social compact formation is consent. The consent or voluntary acquiescence of a given individual is like a grain of sand that contributes to the formation of a sandcastle. The bottom-up view of social compact formation focuses on the placement of each precious grain within the castle. In other words, the bottom-up view focuses on the rights of the grain of sand. 2 The top-down view focuses on the delegation of powers in building the sandcastle. The reserved powers doctrine of the 10th Amendment is about how power and authority are shared by State governments, the general government, and "the people". This is a doctrine that pertains to how an overarching social compact relates to subsidiary social compacts, and to individuals. — As we’ve made clear elsewhere, the general social compact is inherently secular. This is because it is designed as an umbrella social compact that encompasses all religions. It is therefore limited, from a Biblical perspective, to whatever applies to all people. From a Biblical perspective, the only laws that apply to all people are those that are consistent with the global covenant. The mandate against bloodshed is the only term in the global covenant that is both applicable to all people, and a clear, divine, prescription of human law (because it is accompanied by a penalty to be executed by humans against humans). So this umbrella secular social compact is primarily jural. But it’s reasonable and advisable from the perspective of the global covenant that this secular social compact would include some ecclesiastical features that are also consistent with the global covenant. 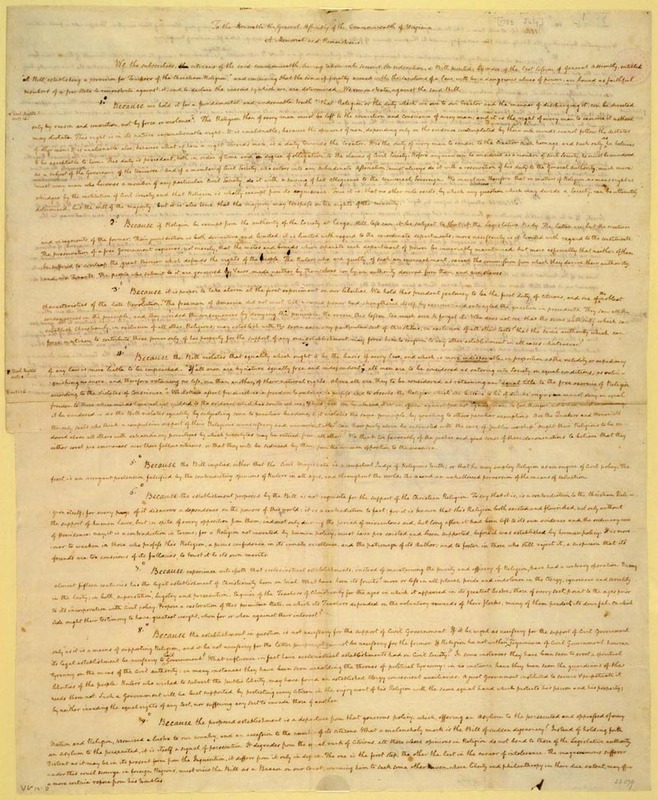 Such ecclesiastical features include keeping records of property claims and adjudication of contract disputes in ecclesiastical courts, where such contracts are inherently secular. So we conclude that any secular social compact, from a Biblical perspective, is primarily jural, and is ecclesiastical only in a limited manner. By way of the incorporation doctrine, the States are now also emphatically secular social compacts. Before the War Between the States, the States may have existed in a sort of grey area between being strictly secular social compacts and religious social compacts. Now that the general government forces the States to incorporate the 1st Amendment, 4 it forces the States to also be umbrella social compacts that cover all religions and belief systems. It therefore forces the States to be secular social compacts, at least from the perspective of the global covenant. The States, like the general government, have a lawful existence when confined to laws that accord with those of a secular social compact. This means that both State and general governments are lawful in executing confiscatory taxation only when the taxes pay exclusively for jural functions. Now it appears that those of us who are committed to keeping government contained within Biblical boundaries have some serious problems. As things stand now, from our perspective, all of secular American government is lawful only if it is a network of secular social compacts. But secular social compacts can say practically nothing about things like (1)who or what we worship; (2)when we worship; (3)how we do business; (4)how we educate our kids; (5)whether or not we use drugs, or tolerate people who do; (6)how we care for indigent and dependent people; or (7)countless other issues. These are all issues that have been traditionally governed by "police powers". Police powers traditionally were aimed at regulating health, safety, welfare, and morals. 6 Now, according to our understanding of the global covenant, there is a radical distinction between two different types of police power: (1)police power that enforces laws against bloodshed; (2)police powers that "regulate" everything else. — Police power has always been an ambiguous term in Anglo-American jurisprudence, because of this failure to distinguish these two basic types of police power. 7 One of the most basic products of the investigation should be a clear, rigorous, and reliable definition of police power. For the sake of moving closer to that kind of definition, we’ll call the first type of police power, bloodshed police power. We’ll call the second kind of police power, religious police power. According to our analysis of Scripture, all human beings inherently have police power with regard to bloodshed. But because of the complexity of enforcing against bloodshed, we are wise to be deferential in our use of this power – deferential towards specialists and experts who are ordained via the office they hold to exercise police powers against bloodshed. So officials of these secular social compacts – according to our analysis – are clearly and obviously legitimate in their exercise of police powers against bloodshed. With regard to these very restricted ecclesiastical features of these secular social compacts – since such features are based entirely upon prior consent – officials of these secular social compacts are legitimate in exercising police powers that pertain to such restricted features, only as long as they strictly observe the consensual nature of these ecclesiastical jurisdictions. Who, how, what, exercises police powers regarding all these countless other issues? In other words, from our perspective, who enforces biblical standards of morality against issues other than bloodshed and these extremely circumscribed secular ecclesiastical features? Since all the police powers that do not relate directly to enforcing against bloodshed crimes are "reserved . . . to the people", and are not lawfully within the immediate jurisdictions of the general, State, county, or municipal governments unless contractually / consensually specified as such, and since precious few Americans are genuinely dedicated to living by biblical standards of morality, where does this leave all the other people? — They get to live as they choose, so long as they don’t violate property rights. Some, perhaps many, may live as libertines. But the libertine’s lifestyle is inherently self-destructive, and will probably not be chosen by many. Others get to choose their friends, values, behaviors, communities, etc., as they do now, except without the same safety, health, welfare, and morality safety-net that they now have via the Welfare State. So if anyone wants these things, he/she needs to participate in some kind of religious social compact. Are we going through this exercise because we intend to start a political movement to change America? — No! The higher the Tower reaches, the more prone to euphoria we get, and the greater the fall when Babel collapses. — It may be too late to reverse all the things that have gone wrong with America. Our purpose is not to create a political movement. Our purpose here is to safeguard the universal church of Jesus Christ, to feed the hearts, minds, and souls of His people by expounding His Holy Covenants. But although His ways are as personal and intimate as anything anywhere, His ways entail that His people compact themselves together in communities of individuals who share a mutual commitment to Him, and to His ways. In other words, our primary purpose here is to build Christian / Messianic Jewish social compacts that preserve the knowledge of His ways. If a political movement develops out of that, whose goal is the restoration of America to solid foundations, so much the better. But if not, then we will be convinced that America’s fate will be the same as Babel’s. Even if America falls, Jesus Christ / Yeshua Ha Meshiach will not. Regardless of what happens to America, there will be a remnant. Our responsibility as such a remnant is to sift through the ashes of this civilization to find everything worth saving, and to put such to use in our Christian communities as quickly as possible. By doing so, we will be preserving civilization within our religious social compacts. If God providentially chooses to make it so, then perhaps our work will help to eliminate the rot in America’s foundations, a healing in time to preclude its fall. If not, then we know He must have something for us that is providentially superior. From one perspective, a hierarchy like the Tower of Babel is being built through the original intent and subsequent implementation of this Constitution. From another perspective, this Constitution copies the hierarchical spheres of influence, the jurisdictions, that are clearly established in Scripture. The single characteristic that marks everything that has gone wrong with American government is this: It has failed to be conscious in all cases of the justification for government’s existence – its raison d’être and raison d’etat. In every case where American government adopted the nature of the Tower of Babel hierarchy, rather than the nature of Biblically sound jurisdictions, it has been because the justification for government’s existence that is obvious from a thoughtful chronological reading of Scripture was subordinated to political demands that subordinate Godly priorities to worldly priorities. Now that we’ve made it clear how a face-value reading of the 10th Amendment can be consistent with the global covenant, we should spend some time looking at the framers’ original intent. Then we should get a glimpse of how the 10th Amendment has been implemented. On June 8, 1789, James Madison fulfilled his promise to the Virginia ratifying convention of 1788 by presenting a "reserved powers" amendment to the general House of Representatives for debate. Elbridge Gerry led an anti-federalist faction that purposed to keep the general government practically as limited as the general government under the Articles of Confederation. 12 On August 18, 1789, Thomas Tucker, a member of Gerry’s faction, presented a modified version of Madison’s proposed amendment. Tucker’s version read like this: "All power being derived from the people, the powers not expressly delegated by this constitution, nor prohibited by it to the States, are reserved to the States respectively.". Madison objected to the anti-federalist’s rendition of his proposed amendment by claiming that it is "impossible to confine a government to the exercise of express powers". Tucker’s proposal was defeated. Immediately after its defeat, Daniel Carroll proposed appending "or to the people" to the end of Tucker’s version, with "expressly" removed. A few days later consensus was found about the present text of the 10th Amendment. 13 — According to the majority opinion of the framers, sovereignty was not lodged in the general government, or in the State governments, but in the people in convention. The general government was a functional compact that had limited police powers. State police powers were generally limited by each State’s Bill of Rights. All other powers were "reserved . . . to the people". The big problem with Hamilton’s view is that it fails to set limits on Congress. If Congress desires to pass laws that blow the general government into a police state, loose construction fails to put adequate restraints on Congress to prevent this. If the flaws in the original Constitution that are cited above were remedied, then strict construction would work fine, assuming that local people are competent to perform the jural and ecclesiastical functions. — Under the original intent, the framers of both schools were clearly using the 10th Amendment as a shield against assuming jural responsibilities with regard to slavery. Since, from the beginning, the federal compact was a secular social compact, jural functions were basic to its existence. But the 10th Amendment guaranteed that the general government would not have original jurisdiction over slavery. But every human being is mandated by God to execute bloodshed police powers. The fact that the framers refused to assume this responsibility with regard to slavery indicates that the general government originally had practically NO police powers with regard to the States. It indicates that local people in slave States were incompetent at fulfilling the jural functions with respect to slavery. It indicates that the framers and early officials of the general government were to slavery what Cain was to Abel after the murder. In effect they generally shrugged with blood still on their hands, saying, "Am I my brother’s keeper?". Supreme Court jurisprudence has followed the Hamiltonian agenda to its logical conclusions. In McCulloch v. Maryland (1819), the opinion of Chief Justice John Marshall clearly followed Hamilton’s lead in defending the Third Bank. 20 He claimed, like Hamilton, that "the police power had been reserved exclusively to the states", 21 but he failed, like Hamilton, to acknowledge that the loose construction of the Constitution left the general government wide open to evolution into a police state. Like Hamilton, Marshall defended his inclination towards national consolidation by claiming that he had done nothing to usurp Reserved Powers. Under the 10th Amendment viewed from the perspective of the global covenant, law enforcement officers of the general government should be committed to being aids and assistants to State law enforcement officers. In other words, in jural subject matter, local and State officials generally have original jurisdiction, and such original jurisdiction needs to be honored by the general government. This is true of the federal system even when it’s recognized that each level of government in the federal system consists of secular social compacts. Even though John Marshall cracked open Pandora’s Box by establishing the Commerce Clause as the mechanism readily available to loose constructionists for eventually establishing the commercial police state, strict construction was predominant between the presidencies of Jefferson and Lincoln. Thus, the general government refused to apply the Bill of Rights to the internal affairs of the States, even in the name of Guaranteeing a republican form of government; and it construed the Commerce Clause, the Contract Clause, the Supremacy Clause, and the Guarantee Clause in favor of the States, largely allowing the States to exercise whatever police powers the States might choose. "Thus, from the presidency of Jefferson to that of Abraham Lincoln, the consensus was that Jefferson had been right in calling the Tenth Amendment the foundation of the constitutional union." 23 During this period, as now, police powers remained largely undefined, evidenced by the fact that in Gibbons v. Ogden (1824), John Marshall claimed that the police powers of the States were "that immense mass of legislation, which embraces every thing within the territory of a State, not surrendered to the general government" (p. 202). Marshall’s successor as Chief Justice, Roger B. Taney, held a similar opinion in the License Cases (1847). To Taney, police powers were "nothing more or less than the powers of government inherent in every sovereignty to the extent of its dominions" (p. 582). The 10th Amendment "was virtually suspended for several years after" the War Between the States – at least as far as secessionist States were concerned. Congress established military rule and pretended that the southern States were eternally part of the Union, and utterly devoid of the privileges and immunities that accrue to States within the Union. Congress did both of these at the same time, thereby exercising a diehard commitment to brutal insanity. It was a breed of insanity reminiscent of all men are created equal, and some men are slaves. Congress essentially exercised plenary police powers over these secessionist States for several years. — Although the 14th Amendment would have far-reaching implications for the national consolidation, when it was ratified, it had little impact on the federal structure, or the 10th Amendment. At the same time that Congress was ruling southern States by martial law, the supreme Court was – in spite of Texas v. White – making marginal attempts at restoring federalism. For example, "In United States v. DeWitt (1869) Chase’s Court did what no antebellum Court had done – voided a congressional statute as intruding unconstitutionally into the ‘sphere’ of state police power.". 26 Congress had made the buying and selling of a highly flammable lamplight oil illegal. The supreme Court exercised its power of judicial review and nullified the statute. From the perspective of the 20th century Welfare State, this intrusion into presumed State police powers is miniscule. The biggest problem that faced the united States after the War Between the States was the evolution of ex-slaves and their progeny from the status of someone else’s property, disqualified by convention from citizenship, etc., into full citizenship. This was necessarily a process of integration into the population that already (presumably) had such full privileges and immunities. At the same time that integration needed to take place, the 1st Amendment right "peaceably to assemble" was implicitly based on consent, which meant that people assembling themselves into businesses, churches, recreational organizations, etc., was largely outside the scope and purview of the general government, as long as the general government honored the 10th Amendment. So the 10th Amendment, under such circumstances, was an impediment to such integration because it allowed white racists to discriminate against blacks. Again, this problem derived largely from the priorities of the Radical Republicans. To legally circumvent the 10th Amendment for the sake of integrating the ex-slave population, Radical Republicans’ priorities needed to be different, namely, (1)to acknowledge that secession is legal, (2)to amend the Constitution to eliminate slavery and all its legal accoutrements, (3)to invade the Confederacy for the sake of terminating its institutionalized bloodshed, (4)to make such slave States territories overseen by the general government until those social compacts were reformed, and (5)then and only then allow such social compacts to reenter the Union as States. 30 Under these circumstances, the 10th Amendment would not apply to these secessionist States, and would not be such an impediment to such integration. Because of the general government’s failure to address secession properly, integration is a problem even to this day. — Integration needs to be voluntary. Integration forced by the general government is a cheap substitute for what should have been done via the War Between the States. Integration happens naturally in the church of Jesus Christ when the church is not impeded by theologies that create anti-Biblical divisions. So early in the 20th century, the general government was using both the Commerce Clause and the Taxing and Spending Clause 34 to exercise police powers that rightly belong only to religious social compacts. The general government had been trying to walk a tightrope between the 10th Amendment, on one side, and the Commerce and Taxing and Spending Clauses, on the other. In spite of the fact that Congress had passed statutes like the Interstate Commerce Act and the Sherman Antitrust Act well before the 20th century, the supreme Court didn’t really start going along with Congress’s agenda of arrogating police powers until early in the 20th century. More such acts by Congress that were supported by the supreme Court were the Pure Food and Drug Act (1906), the Meat Inspection Acts (1906 and 1907), and the White Slave Traffic Act (1910). These were each based on the Commerce Clause, and the Court sustained them against arguments that they violated the 10th Amendment. Such congressional acts that were based on the Taxing and Spending Clause were the Phosphorus Match Act (1912) and the Harrison Anti-Narcotics Act (1914). These were also usurpation by the general government of police powers, where such usurpation faced arguments that they violated the 10th Amendment. 35 — In some respects, Congress was right in taking such powers away from the States, because the States are secular social compacts that should not have such powers. But the general government is also a secular social compact. So such police powers are "reserved to . . . the people", not to the States, and not to the general government. The 10th Amendment arguments against these acts of Congress were almost entirely State’s rights arguments, not "reserved to . . . the people" arguments. Because of the way property rights are implicitly defined in the global covenant, the definition of property is dependent upon, and directly linked to, the definition of police powers. The global covenant implicitly posits primary property, which is one’s ownership of one’s own physical body (not someone else’s); and secondary property, which is one’s ownership of physical objects external to one’s body, including land. In ancient jurisprudence, this linkage of the concept of property to primary and secondary property and police powers was sometimes recognized. Implicit in this ancient definition is the inclusion of "civil liberties" as a subset of property. — In Gilbert v. Minnesota (1920), Justice Brandeis wrote a dissenting opinion in which he indicated his inclination to believe that the "life, liberty, or property" referenced in the 14th Amendment might protect "civil liberties" as well as property rights. "That argument began to take on substance when Justice McReynolds, in Meyer v. Nebraska (1923), struck down a state law . . . . Liberty, McReynolds declared, went beyond freedom from bodily restraint to include ‘those privileges long recognized at common law as essential to the orderly pursuit of happiness by free men’ (p. 399).". 38 — The position of the global covenant is that civil liberties ARE property rights. Sometimes the supreme Court can act like it knows this. Because of the linkage between property rights and police powers, the enforcement of the 10th Amendment is directly linked to the definition of property rights. The total rejection of the 10th Amendment is essentially arrogation by the general government of all police powers. By claiming that the general government has boundless police powers, the general government is essentially claiming that it is a religious social compact, rather than a secular social compact. If the general government is a religious social compact, then we’re inevitably led to wonder precisely what religion is being imposed, top-down, on those of us who are conscientious dissenters against its claims to absolute sovereignty. — During the 1930s and 40s, the 10th Amendment became a nullity. Those of us who care about rights may not care about the loss of State’s rights, because the States have gained a well-deserved reputation for abusing rights. They therefore don’t deserve extensive police powers. But the fact that the powers "reserved to . . . the people" have become a nullity with the demise of the 10th Amendment should strike terror into anyone who cares about rights. After Roosevelt’s court-packing plan, the supreme Court justices acted like they all had rings in their noses allowing Roosevelt to lead them passively along with his agenda. For example, in Mulford v. Smith (1939) the Court totally abandoned opinions it had established earlier that were based on the 10th Amendment. In United States v. Darby (1941), Chief Justice Harlan Fiske Stone claimed the 10th Amendment was "but a truism", a mere declaration of intergovernmental relationships that lack significant importance. 42 In other words, after Darby, the 10th Amendment merely declares that States are administrative provinces. From the perspective of the global covenant, if Congress ignores the 10th Amendment in order to exercise bloodshed police powers that are being neglected by State or local jural societies, there is no serious problem, because somebody must do that kind of dirty job. But if Congress ignores the 10th Amendment for the sake of exercising religious police powers, regardless of its motive, it is making a serious mistake, and committing bloodshed in the process. This is because a prerequisite to religious police powers is prior consent. Because the general government is a secular social compact, there’s no way for it to assume prior consent to religious police powers. It cannot assume consent. It must be certain. Otherwise it’s bloodshed. This repudiation of the federal system by way of the establishment of a monolithic national government is the logical outcome of a legal philosophy that started getting popular in the early part of the 20th century, and was part of some of the political movements of that time. "The New Deal can be seen, in part, as the legislative analogue of legal realism, with its emphasis not on abstract theory but on fact: that is, did a program work or not." 43 Legal realism – this outgrowth of American jurisprudence that was/is compatible with the New Deal – is essentially a final abandonment of the legal principles that were foundational to the formation of the united States. It is a final abandonment of the compact theory of government under the pretense that the latter is just so much idealism. It utterly fails to recognize that the compact theory is built on consent. It treats consent as negligible, in the same way that it treats human beings as little more than apes. It is pragmatism devoid of reason, and ignorant of context. It is the abandonment of any reasonable moral framework through which to view and understand American jurisprudence. In place of a moral framework, legal realism adopted a "whatever works" approach to jurisprudence. The problem with this centers around the need to discover a definition of "works". Who defines what’s functional and what’s not? A consent-oriented moral framework supplies such a definition automatically. Legal realism has no inherent moral framework, and therefore has no inherent mechanism for evaluating what works. The result is ad hoc definition of the law, and of what works and what’s functional. The cumulative effect of such ad hoc definitions is that the law becomes arbitrary and capricious. It becomes rule by fiat, under a guise of legality. It makes all government colorable. — Jurisprudence is composed of law and fact. Legal realism is the abandonment of law under the pretense that fact will suffice. After the legal revolution of the 1930s and 40s, by the middle of the 1950s, property rights were defined so that there was a split between property rights and "individual liberties". Property rights were something that the general government claimed it had power and authority to control. As a consolation prize, the American people were given "constitutional protections of life and liberty". 44 But this split between "property rights" and "individual liberties" is bogus. It’s based on unscriptural, unsound, irrational definitions of each. These lousy definitions probably have their roots in slavery, or at least in confusion about ownership by one person of other people. According to slavery, people ARE property. When people get contractual relations confused with their notion of ownership, they’re likely to believe that they own the other person, when in fact they merely have a contract with the other person. Only delusions of grandeur can lead Person A to believe he deserves the involuntary servitude of Person B, unless Person B has committed bloodshed and therefore deserves incarceration, death, or involuntary servitude. — In many respects, this confusion regarding "property rights" and "individual liberties" is at the crux of all our problems. — Do you own your body? 45 Can you exercise "individual liberties" without owning your body? The first step towards genuine integration is not entitlement programs or coercing businesses by instructing them in who their customers will be. The first step towards integration is making certain that bloodshed is not being perpetrated. This is done by executing retribution against perpetrators. To procure justice in the slave States, the northern invaders should have executed retribution against slave owners. Since they did not do that, the whole nation was guilty of being accessories to bloodshed. Now, fourteen decades later, the first step towards integration is still the same: to make certain that perpetrators of bloodshed receive retribution. It is absolutely NOT having the monolithic government execute bloodshed against relatively innocent people. In Shelley v. Kraemer (1948) and Hurd v. Hodge (1948) the supreme Court continued its application of its plenary Commerce Clause doctrine by ruling covenants illegal because such covenants refused to allow African-Americans to own houses in European-American neighborhoods that were covered by such covenants. Anyone who enters into such racial covenants inevitably has a streak of moral stupidity that would gag practically anyone else who genuinely believes that all people are created in God’s image. Even so, anyone with half a brain can see that the supreme Court is using a grandiose conception of the Commerce Clause that relegates the Contract Clause to oblivion. 50 Why shouldn’t we allow the stupid to associate exclusively with the stupid, if that’s what they want? Let them have their stupidity. Let them also know that if they perpetrate bloodshed, they will not get away with it. But entering into an exclusive covenant, by itself, to exclude people smarter than oneself, is not bloodshed. The fact that restrictive covenants were used by racists to try to set up religious social compacts based on stupidity – rather than on a rational reading of Scripture – doesn’t mean that all restrictive covenants are wrong. Covenants are nothing more than a type of contract. As such, they can be good or bad, or some mixture of the two, based upon what they are intended to do, and how they are structured and implemented. It became clear in the 1950s and 60s that the supreme Court’s intention was the dismantling of Jim Crow through racial integration. But as long as property rights are not properly defined, and the compact theory of government is rejected, we have not recovered from the War Between the States, and all authoritarian efforts at integration will fall short of success. It is more of the same syndrome: (1)Government creates or allows the creation of a problem by abusing or allowing the abuse of property rights. (2)Government intentionally or unintentionally misidentifies the cause of the problem. (3)Government creates a pseudo-solution, thereby creating an all-new and different problem. (4)Government repeats this loop until the entire society is tied in such knots that it will inevitably implode. In practically all of the consolidation associated with this reapportionment, the supreme Court was doing what should have been done a hundred years earlier. It should have been done to the south while the south was territorialized, and not a full member of the Union. But it was far too important to the north’s political and commercial leaders to get the south back into the Union, with imperial motives. Freeing slaves and executing retribution against slave owners were low priority to them. The other major change in supreme Court jurisprudence that has happened since the end of World War II is incorporation of most of the Bill of Rights, making the Bill of Rights applicable to the States. 56 While this may look on its face like a violation of State’s rights, it is in fact a protection of "powers . . . reserved . . . to the people". But the supreme Court in recent decades has been consistently attempting de facto un-incorporation – a very dangerous process. In 1976, in National League of Cities v. Usery, the supreme Court ignored the fact that it had earlier held that the 10th Amendment was a nullity, by issuing the opinion that "application of the Fair Labor Standards Act to state and local government employees was a violation of the amendment". 57 This decision stirred up so much trouble for the Court that it reversed itself nine years later, in Garcia v. San Antonio Metropolitan Transit Authority (1985). As we’ll see when we examine the 1st Amendment, the supreme Court is still making some rather pathetic attempts at reviving the 10th Amendment. Without a major overhaul to our whole system of jurisprudence, it’s not likely that the 10th Amendment can be revived. Given that States, like the general government, are secular social compacts at their core – and are unlawful to the extent that they deviate from this secular calling – the loss of the doctrine of State’s rights is nowhere near as serious a problem as the loss of "The powers . . . reserved . . . to the people". This is because "The powers . . . reserved . . . to the people" include, above all other powers, the power to create, maintain, and operate religious social compacts. Our whole nationally consolidated social superstructure is built on the assumption that such religious social compacts are negligible, superfluous, and silly. But Christians are called by God to live in compact with one another. We are called to be covenant-keeping people. To relegate the religious social compact to oblivion is to relegate Biblical Christianity to oblivion. The general government and the States are unlawful at the beginning of the 21st century because they assume practically ALL police powers, thereby ignoring the consent that is a prerequisite to religious police powers, and thereby subjecting ordinary people to unlawful duress. Clear definition of police powers is crucial to lawful delineation of relative subject matter jurisdictions of general and State governments, and the distinction between those powers and those that are reserved to the people. But the supreme Court has no such clear definition. They allow the existence of non-consensual police powers, and that allowance turns their entire legal system into a glorified briar patch. 1The Prince, Chapter VI, "Concerning New Principalities Acquired by One’s Own Arms and Ability", p. 27. 2"[W]hat is . . . a right towards men, is a duty towards the Creator." — Taken from James Madison’s "Memorial and Remonstrance Against Religious Assessments", written to the Virginia General Assembly in 1785. The quote appears at Principles of Confederacy, p. 530. Also see it in The Founder’s Constitution at University of Chicago Press, URL: http://press-pubs.uchicago.edu/​founders/​documents/​amendI_religions43.html, and at Library of Congress, URL: http://www.loc.gov/​exhibits/​madison/​images/​vc3.jpg. 3Bill of Rights URL: ./0_6_Bill_of_Rights.htm. 4In recent years, the supreme Court has in effect been trying to un-incorporate the free exercise clause. When we examine the 1st Amendment, we’ll address this presumptive un-incorporation process in detail. But even without incorporation, it’s obvious that all States are either secular social compacts or unlawful. This is because all State constitutions contain religion clauses like those in the general Constitution. — 1st Amendment URL: ./0_8_0_Am_I_(Intro_-_Orig_Intent).htm​#AmendI. 5This leads us naturally to wonder how "regional councils" and other "regional" governments fit into this. Given that we’re focusing on the Constitution, we’ll not address this issue, other than to say that these "regional governments" are outgrowths of the administrative state, and most (if not all) of these administrative agencies would be eliminated through the Biblical standard of compact formation. 6"Police power, the general authority of a sovereign to regulate for the health, safety, welfare, and morals of its people" — The Oxford Companion to the Supreme Court of the United States, p. 379, "History of the Court: Establishment of the Union", by William M. Wiecek. — Since this is how "police power" is defined, we must inevitably conclude that religious social compacts have this "general authority of a sovereign to regulate for the health, safety, welfare, and morals of its people", but secular social compacts lack this "general authority". The regulation of health, safety, welfare, and morals includes both jural and ecclesiastical jurisdictions. Secular social compacts have enumerated and circumscribed authority that revolves primarily around the jural impetus, the agreements and contracts that define due process (both procedural and substantive), and legal mechanisms by which contractual disputes and jurisdictional clashes can be resolved. Except in the case of extreme and obvious threat, proactive regulation of health, safety, welfare, and morals does not fall within this jurisdiction. Only adjudication of delicts and secular contract disputes (including conflicts between state compacts and diversity jurisdiction) fall within this secular jurisdiction. 7"For two centuries, judges and scholars alike have repeatedly affirmed that the concept of the ‘police power’ resists a clear definition. Indeed, it seems that the leading characteristic of the police power is that its definition changes with shifting social economic realities and with changing political conceptions of the legitimate reach of governmental authority. ‘An attempt to define its reach or trace its outer limits is fruitless,’ Justice William O. Douglas asserted in Berman v. Parker (1954), ‘for each case must turn on its own facts. . . . The definition is essentially the product of legislative determinations’ (p. 32).
" . . . [T]he 1776 declarations of rights in Pennsylvania, Vermont, and Delaware asserted that the people had ‘the sole, exclusive, and inherent right of governing and regulating the internal police’ of the state. The Maryland declaration of 1776 similarly stated that ‘all government of right originates from the people, is founded in compact only, and [is] instituted solely for the good of the whole. . . . The people of this State ought to have the sole and exclusive right of regulating the internal government and police thereof’ – language also found in North Carolina’s declaration." These three paragraphs are from The Oxford Companion to the Supreme Court of the United States, pp. 639-640, "Police Power", by Harry N. Scheiber. 8Not only biblical standards of morality, but also "biblical standards" of health, safety, welfare, and education. 9See 1st Amendment, URL: ./0_8_0_Am_I_(Intro_-_Orig_Intent).htm​#AmendI. 10Freedom and Federalism, pp. 4-5. — This quote of Morley appears in Carson's Basic History of the United States, Vol. 5, pp. 274-275. — The root problem that led to the War Between the States and Jim Crow was that "that assumption" was not valid in the slave States. 11For more on this, see the 1st Amendment, URL: ./0_8_6_Am_I_(Parade_of_Horr).htm​#AmendI. 12The Oxford Companion to the Supreme Court of the United States, pp. 862-863, "Tenth Amendment", by Forrest McDonald. 13See (i)House debates, June 8, 1789: (a)1 Annals of Congress pp. 424-450, URL: http://memory.loc.gov/​cgi-bin/​ampage?​collId=​llac&​fileName=​001/​llac001.db&​recNum=213; (b)Patterson’s Ninth Amendment, pp. 100-127; (ii)House debates, August 18 and 21, 1789: (a)1 Annals of Congress pp. 761, 767-768, URL: http://memory.loc.gov/​cgi-bin/​ampage?​collId=​llac&​fileName=​001/​llac001.db&​recNum=382; (b)Patterson’s Ninth Amendment, pp. 193, 197. — The summary of this information comes from Principles of Confederacy, pp. 57-58. 14"The republican constitutions of the American Revolution were built on very different principles. The sovereign power was vested in and retained by the people, who, in setting up regular governments, never granted legislative supremacy to wipe away the inalienable and inherent rights of man under natural law or the matured fruit of constitutional traditions. Such privileges and immunities were all reserved by the people, as against their respective States, and as against the Union, even if not expressly enumerated in a bill of rights, as Hamilton said so well in the 84th Federalist." — Principles of Confederacy, p. 547. — See Federalist No. 84, URL: http://www.constitution.org/​fed/​federa84.htm. 15The Oxford Companion to the Supreme Court of the United States, pp. 862-863, "Tenth Amendment", by Forrest McDonald. 16Some say "First Bank", thereby ignoring the bank that was created by the Continental Congress in 1781. For more about the 1781 Bank, see The Creature from Jekyll Island, pp. 325-340, Chapter 16, "The Creature Comes to America". 17The Oxford Companion to the Supreme Court of the United States, pp. 862-863, "Tenth Amendment", by Forrest McDonald. 18The propensity to national consolidation realized by this acceptance of Hamilton’s loose construction was huge. Anyone who doubts this should read The Creature from Jekyll Island. 19The Rehnquist Court may have spent a couple of decades trying to return the general government to limited police powers. (i)They had limited success. (ii)Returning to the ancient status quo wouldn’t fix the underlying problem, which is the failure to distinguish jural police powers from all others. 20Some say "Second Bank", thereby ignoring the First Bank that was created by the Continental Congress in 1781. For more about the First Bank, see The Creature from Jekyll Island, pp. 325-340, Chapter 16, "The Creature Comes to America". — To understand the far-reaching implications of McCulloch v. Maryland on monetary and banking policies, see The Creature from Jekyll Island, pp. 341-360, Chapter 17, "A Den of Vipers". 21The Oxford Companion to the Supreme Court of the United States, pp. 862-863, "Tenth Amendment", by Forrest McDonald. 22See Article I § 8 cl 3, URL: ./0_2_1_2_Art_I_Sec_8_Cl_3.htm​#Gibbons. 23The Oxford Companion to the Supreme Court of the United States, pp. 862-863, "Tenth Amendment", by Forrest McDonald. 24The Oxford Companion to the Supreme Court of the United States, pp. 831-832, "State Sovereignty and States’ Rights", by A. E. Keir Nash. 25The Oxford Companion to the Supreme Court of the United States, p. 282, "Federalism", by Harry N. Scheiber. — The compact theory was championed not only by State’s rights advocates, but also by the framers themselves. In fact, it is a derivative from any rational reading of Scripture. Even though slavery exists in the Biblical chronology, from the Abrahamic Covenant to the end of the New Testament era, it is discouraged and restricted between people who are party to the same social compact. Since the Messianic Covenant, all who believe that Jesus is the Messiah are implicitly called to acknowledge the global covenant, and to thereby refrain from making anyone a slave. The compact theory adopted by the slave States failed to recognize this. It was therefore inherently flawed. Even so, the rejection of the compact theory of government is equivalent to a rejection of Scripture. 26The Oxford Companion to the Supreme Court of the United States, pp. 831-832, "State Sovereignty and States’ Rights", by A. E. Keir Nash. 27This is a perfect reason why a secular social compact should never run a business – because running a business by its very nature requires those running it to make decisions about health, safety, morals, and welfare. In other words, people running the business are inevitably obligated to make moral judgments and execute police powers within the confines of their business. Given that there is a radical distinction between bloodshed police powers and religious police powers, and given that a secular social compact is limited almost exclusively to executing bloodshed police powers (because it executes religious police powers only after it adjudicates a secular contract), and given that a secular social compact cannot make non-contractual, non-bloodshed decisions without abandoning its secular nature, and becoming a religious social compact, it’s a radically bad idea for a secular social compact to run a business. — For more about this, see Article I § 8 cl 7, URL: ./0_2_1_5_Art_I_Sec_8_Cl_6-18.htm​#Article1Sec8Cl7. 28In the Civil Rights Cases (1883). 29The Oxford Companion to the Supreme Court of the United States, pp. 862-863, "Tenth Amendment", by Forrest McDonald. 30See the idealistic plan for eliminating slavery in Article II § 2, URL: ./0_3_Art_II.htm​#IdealPlan. 31Whenever biblical standards of morality that do not pertain directly to bloodshed (i.e., that are "victimless crimes") are enforced through the police powers of a secular social compact, (1)the presumably righteous think they’re doing a righteous thing by creating and enforcing the law; (2)the prices for such illicit, black market products and services rise drastically; and (3)corrupt entrepreneurs take the situation as an opportunity to make a fast buck. A vortex of corruption is created. "Good" people who lacked understanding of jurisdictional boundaries instigated the vortex. 32Apparently, dairy farmers and others believed that oleomargarine was unhealthy, and persuaded Congress to use the Commerce Clause to exercise a police power over the buying and selling of it. 33In fact, the religious police power that’s lawful under Article I § 8 clause 3 is not really a religious police power. It is also bloodshed police power, even if it is injunctive. — Article I § 8 clause 3 URL: ./0_2_1_2_Art_I_Sec_8_Cl_3.htm​#Article1Sec8Cl3. 34See Article I § 8 cl 1, URL: ./0_2_1_0_Art_I_Sec_8_Cl_1.htm​#Article1Sec8Cl1. 35The Oxford Companion to the Supreme Court of the United States, pp. 862-863, "Tenth Amendment", by Forrest McDonald. 36The Oxford Companion to the Supreme Court of the United States, pp. 862-863, "Tenth Amendment", by Forrest McDonald. — "In 1921 Congress passed the Sheppard-Towner Act, which provided grants to promote state infant and maternity care programs. Congress had passed the first grant program, the Weeks Act, in 1911 to encourage state forest fire prevention programs, but there had been no constitutional challenge until Massachusetts [(in Massachusetts v. Mellon)] attacked the Maternity Act" (The Oxford Companion to the Supreme Court of the United States, p. 531, "Massachusetts v. Mellon", by Melvin I Urofsky). 37"Ultimately, and especially from the 1950s onward, grants-in-aid or ‘revenue sharing’ would grow so large as to make the states, in many ways, mere appendages of federal administrative agencies." In other words, the general government was methodically turning the States into administrative provinces. — The sentence in quotes is from The Oxford Companion to the Supreme Court of the United States, pp. 862-863, "Tenth Amendment", by Forrest McDonald. 38The Oxford Companion to the Supreme Court of the United States, pp. 391-392, "History of the Court: The Depression and the Rise of Legal Liberalism", by Melvin I. Urofsky. 39The Oxford Companion to the Supreme Court of the United States, pp. 284-285, "Federalism", by Harry N. Scheiber. 40The Oxford Companion to the Supreme Court of the United States, pp. 284-285, "Federalism", by Harry N. Scheiber. 41The Oxford Companion to the Supreme Court of the United States, pp. 284-285, "Federalism", by Harry N. Scheiber. 42The Oxford Companion to the Supreme Court of the United States, pp. 862-863, "Tenth Amendment", by Forrest McDonald. 43The Oxford Companion to the Supreme Court of the United States, pp. 392-393, "History of the Court: The Depression and the Rise of Legal Liberalism", by Melvin I. Urofsky. 44The Oxford Companion to the Supreme Court of the United States, p. 390, "History of the Court: The Depression and the Rise of Legal Liberalism", by Melvin I. Urofsky. 45Note for Christians: According to 1Corinthians 6:19-20, we don’t own our bodies because we have given them to God. But you can’t give something that you don’t own. So our "natural" state is to own our bodies. 46"[I]n American Power & Light Co. v. Securities and Exchange Commission (1946), the Court declared that congressional authority to regulate must be ‘as broad as the economic needs of the nation’ (p. 141). Throughout most of the post-World War II era, the Court has continued to uphold nearly plenary congressional authority to control economic institutions and behavior: and state legislatures and administrative agencies have been given wide latitude with respect to regulation of property rights." — The Oxford Companion to the Supreme Court of the United States, pp. 642-643, "Police Power", by Harry N. Scheiber. — Given that very little of modern American life is construed as not being commercial, the general government has plenary power to do practically anything. Almost the only thing stopping the general government from doing whatever it wants is the threat of bad publicity. Real freedom hangs by a thread, as "freedom" is bastardized in the vernacular. 47The Oxford Companion to the Supreme Court of the United States, pp. 396-397, "History of the Court: The Depression and the Rise of Legal Liberalism", by Melvin I. Urofsky. 48The Oxford Companion to the Supreme Court of the United States, pp. 396-397, "History of the Court: The Depression and the Rise of Legal Liberalism", by Melvin I. Urofsky. 49The Oxford Companion to the Supreme Court of the United States, pp. 393-394, "History of the Court: The Depression and the Rise of Legal Liberalism", by Melvin I. Urofsky. 50If "No State shall . . . pass any . . . Law impairing the Obligation of Contracts" (Article 1 § 10 cl 1, URL: ./0_2_3_Art_I_Sec_10.htm​#Article1Sec10Cl1), then where does the general government get off doing so. If European-Americans are denied the unalienable Right to contract with, assemble with, do business with, etc., whoever they want, on a consensual basis, then African-Americans will also almost inevitably suffer some similar repudiation of unalienable Rights. 51Equality before the law and integration are two different things, proven by the way integration has been pursued. In fact, they should be the same, and the pursuit of integration should have been the same as pursuit of equality before the law, ever since the end of the War Between the States. The fact that Plessy v. Ferguson posited "separate-but-equal", and failed in providing equality, is not a reason to force racial integration, thereby turning integration into something other than equality before the law. One big problem with "separate-but-equal" was the use of force to maintain separation. — Some might claim that even if both racial segregation and racial integration were totally voluntary, there would be gross inequality before the law, i.e., the Equal Protection Clause would be violated. But if a secular social compact is trying to be a religious social compact that exercises religious police powers, the chances of violation of the Equal Protection Clause increases hugely. This is precisely the state of things at present. Equality before the law means equality regarding the protection of rights and equality regarding dispensation of privileges. Since the general government is trying to be a religious social compact, if it dispenses privileges, and it’s impossible to count them all, then it’s impossible to verify that they are distributed equally. 52For more about Cooper, see The Oxford Companion to the Supreme Court of the United States: (i)pp. 197-198, "Cooper v. Aaron", by Tony Freyer; (ii)p. 436, "Interposition", by Paul Finkelman; and (iii)pp. 197-198, "Marbury v. Madison", by Herbert A. Johnson. 53Racial integration is ultimately a question of conscience that must be determined privately by each individual. Who the sovereign is – according to a compact theory of government that interprets Scripture reliably – also determined by conscience (by the sovereignty of each individual), because the sovereign is the collective consent of the governed. It is therefore a function of collective consciences. This may seem hard to swallow, given that it requires trusting ordinary people, rather than exalted judges and politicians. But given the fact that bloodshed is something that can be identified even by morons, we’re all much safer trusting the compact theory’s definition of sovereignty, than trusting the supreme Court’s arrogation of sovereignty. 54Carson’s Basic History of the United States, Vol. 5, pp. 224-228. 55Excerpt from George Washington’s farewell address after his second term as President: Quoted at Carson’s Basic History of the United States, Vol. 5, p. 232. — See Washington’s Farewell Address, 1796, URL: http://avalon.law.yale.edu/​18th_century/​washing.asp. 56See the article, "Bill of Rights", URL: ./0_6_Bill_of_Rights.htm, for more about incorporation. 57The Oxford Companion to the Supreme Court of the United States, pp. 862-863, "Tenth Amendment", by Forrest McDonald.